If you have sinus problems, you may think spring and summer are the most difficult times of the year. But in many cases, winter can make your symptoms worse, making you miserable for months. 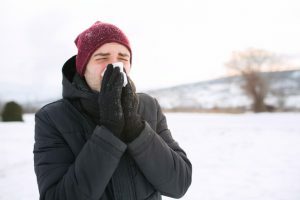 In this blog, the ear, nose, and throat specialist Dr. Cecil Yeung of Houston Sinus Surgery at the Yeung Institute explains more about how winter can affect your sinuses. How does winter make sinus problems worse? Colds – Although cold weather doesn’t cause colds, it does make people spend more time indoors, in close quarters with one another where they’re more likely to spread cold germs. Colds can sometimes lead to a sinus infection. Environmental allergies – As you spend more time indoors with doors and windows closed, you’re exposed to possible allergens such as fragrances and candles. These can also lead to a sinus infection. Mold – If you have a live Christmas tree or wreath, it may have mold growing on it, and the same is true of an artificial tree or ornaments that have been stored away in a musty basement or attic. Drier air – The air you breathe in is usually less humid in the winter. This is especially true if you are indoors with the heat running, and breathing in dry air dries out your sinuses and can make existing sinus problems worse. Pets – Just like you, your pet may spend more time in the house during winter months. You may be allergic to pet dander, which can inflame your sinuses. Carpets and furniture – All that time spent indoors can expose you to dust and other allergens that are harbored in carpets and furniture. Alcohol – The holiday season can be a time when you may drink more alcohol than usual. This can cause the skin inside your nose to swell. How can you reduce these effects? Avoid catching a cold – Take care of yourself by getting enough sleep and eating healthy foods. Also make sure to wash your hands before eating, and avoid touching your mouth and nose. Change your flooring if necessary –If you have carpet in your home, change your flooring to hardwood or tile if you can. Otherwise, make sure your carpeting is cleaned regularly. Cover your mattress and pillows – Use allergen-proof covers on your mattress and pillows. Wash your bedding regularly to get rid of dust mites, and if you have pets, don’t let them sleep with you. Cut down on mold – Store an artificial Christmas tree, wreath, or ornaments in a dry place so they don’t develop mold. If you suspect they may already have mold, open them outside and let them air out for a few days. Reduce your alcohol consumption – If you’re prone to sinus problems, reduce your consumption of alcohol during the winter months. If you have sinus infection problems, make an appointment today for an evaluation at Houston Sinus Surgery at the Yeung institute. We’ll diagnose the underlying cause of your sinus infection and help you get through the winter breathing easier.